“It was absolutely amazing – windless and starlit. As far as I know there’s never been this many people gathered for a mountain-top event,” says Eva Bratholm, Communications Director at The Norwegian Agency for Development Cooperation (Norad), to Visit Norway. 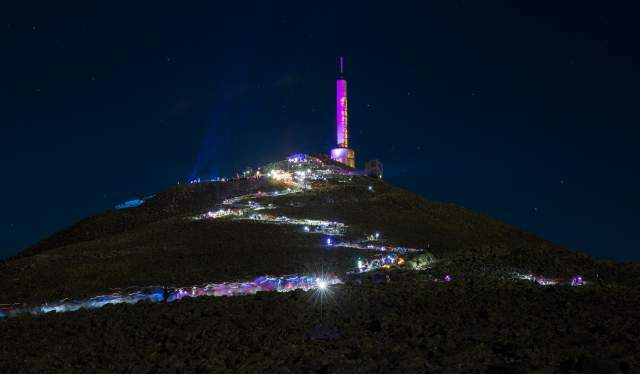 She is still elated after Saturday’s experience, when Norad – in cooperation with Tinn municipality and a number of NGOs – organized “the world’s most beautiful night walk” to the summit of Gaustatoppen (1,883 meters above sea level). The goal was not only to have an amazing experience and get beautiful pictures, but also to “illuminate the UN’s sustainability goals”, a joint initiative for eradicating poverty, combating inequality and halting climate change by 2030. Along the 4.4-kilometre route, Norad had put up illuminated stops where one could read more about the individual goals. The most popular hike to the summit usually takes two to three hours. For those who made it to the top, there waited a reward: A concert with acclaimed Norwegian artist Sivert Høyem. “I’ve never played on a mountain before, or so close to a cliff,” said Høyem, according to NTB. At 1,883 meters, Gaustatoppen is the highest mountain in Telemark county. It towers 1,600 meters above the valley where you find the city of Rjukan. From the summit, you get the country’s greatest view: On a clear day, you can see an area of 60,000 square kilometres, or one-sixth of mainland Norway. Those attending were offered to use the subterranean funicular (cable railway) back down from the mountain, according to NRK. Despite large crowds, there were no reports of injuries, beyond a couple of twisted ankles. The audience was well looked after by volunteers from the Red Cross and the Norwegian Trekking Association. Norad is a governmental organization for development cooperation, working to provide professional council and evaluating aid initiatives.